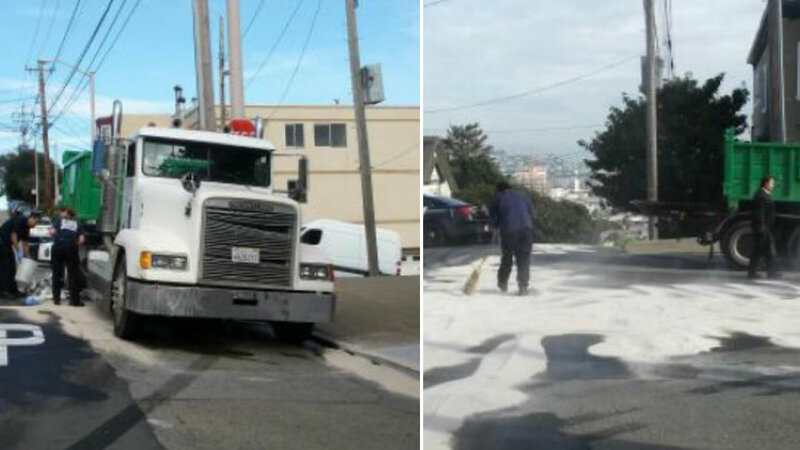 SAN FRANCISCO -- A large fuel spill from a big-rig in San Francisco's Noe Valley neighborhood has led the city's Department of Emergency Management to urge anyone in the immediate area to stay inside. The fuel spill was reported at 12:12 p.m. near the intersection of 28th and Noe streets, according to San Francisco fire spokeswoman Mindy Talmadge. Talmadge said the big-rig, which remains parked at the top of the hill, was spilling diesel fuel into the street. She said fire crews arrived at the scene, confirmed a "major diesel spill" and got to work laying absorbent material on the street to prevent any more fuel from running into the sewer system. Talmadge said crews are siphoning gasoline out of the truck's fuel tanks and that the city's Department of Public Works has been called to the intersection to handle fuel that ended up in the sewer. The spill was reported by a third party, who apparently didn't see a responsible party with the truck as fuel spilled into the road, according to Talmadge. Talmadge said police are investigating the incident and are working to determine who is responsible for the truck.